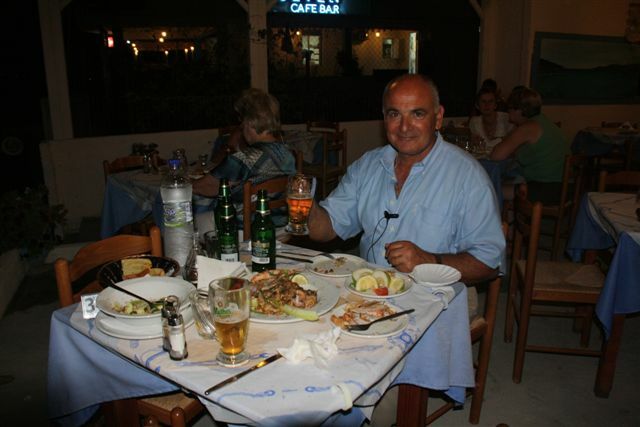 A client reference to share with you – Gary’s adventures on Andros … part 1. Perhaps you will now understand the unusual joy with which I waited patiently in bucketfuls of rain on the boarding bridge to Flight TOM6850 to Kephalonia, while seats 16 to 37 took their time deciding, in a leisurely fashion, which bag should be stowed and which put under their feet, where their reading glasses were, whether they even needed their reading glasses, whether they could even find the magazines they had just bought to read, whose turn it was to have the window seat, and who had the weakest bladder and needed the aisle seat. I do assure you that I felt completely happy. Arriving in Kefalonia into the embrace of a balmy evening and Dionysi our taxi driver, I thought how grateful I am to have this job. Dionysi and I dined on fresh calamari and giant prawns down by the sea, at Andreas’ Meze taverna on Lourdas beach (highly recommended) , with little moonlit waves lapping at our feet, and then we licked our fingers clean and drove on. 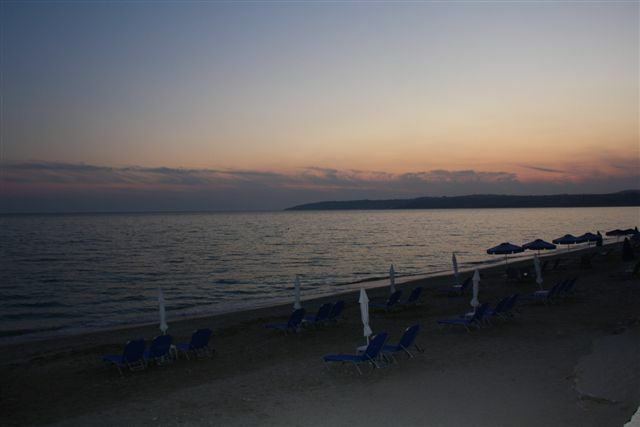 Skala is a semi-tropical beach resort area, where the Mare Blu Hotel in Apostolata lies. Just beyond is the Turtle beach of Mounda, where the rare Caretta Caretta turtles plough their way up the sandy beach to lay their eggs once every three years by full moon. If they are disturbed three times, they abort the eggs and return to sea for another three years. As they are fussy and only want to lay their eggs in fine golden sand with warm shallow water, they are often disturbed, as developers also like to build nests on such beaches, but are a lot harder to disturb. This is why Caretta Caretta are rarer than developers. A full moon in a warm, bronze sky shone on us all the way to the hotel, leaving gold splashes in the sea over which it had risen. This is the way to banish hospital administrators and plumbers from the mind, I thought, though I couldn’t help noticing that the hotel shower trip wires looked suspiciously un-merged and only partially Earth-bonded. They probably didn’t feel like knocking it all down and starting from scratch either…. « Mamma Mia! This is what a Villa Holiday is all about….